Riding on a blistering 30-ball 89 by Mohammad Nabi and a fiery 72 from Mohammad Shahzad, Afghanistan completed a clean sweep against Ireland in Greater Noida, winning a tall-scoring third and final T20 International on Sunday (March 12) by 28 runs. In doing so, it extended its winning streak to 11 T20I games. Nabi went hammer and tongs from the word go, smashing six fours and nine sixes to help Afghanistan post 233 for 8 in 20 overs, its highest total in the format. Ireland made a brilliant start to its chase and showed great heart throughout but the magnitude of the target eventually wore ot down, and it was bowled out for 205 in the final over. 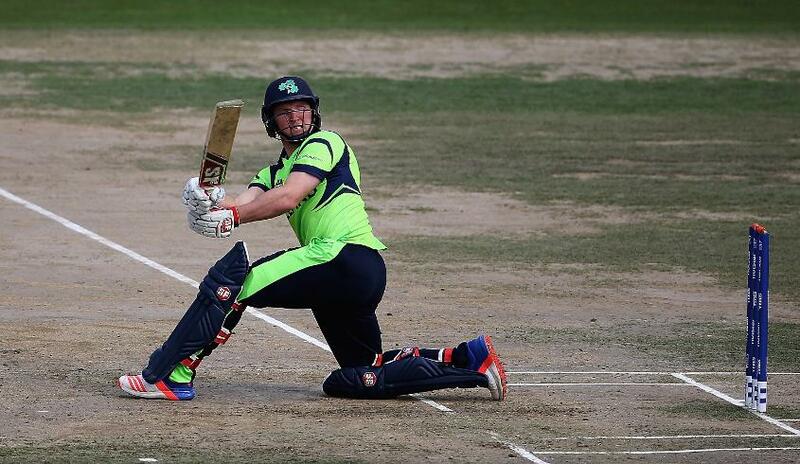 Paul Stirling (49 off 20) and Stuart Thompson (43 off 18), the openers, gave Ireland a flying start. When Stirling fell to Shapoor Zadran off the second ball of the fourth over, Ireland already had 65 on the board. Thompson kept up the charge, but after Amir Hamza had him with a slower ball, Ireland's bold chase started losing south. Gary Wilson, the wicketkeeper-batsman, kept Ireland’s hopes alive. Despite inadequate support from the other middle-order batsmen, Wilson kept finding the boundaries to keep his scoring rate at over 170. His fall to Rashid Khan, the leg-spinner, in the 19th over for 59 from 34 balls including five fours and two sixes as good as sealed the deal for Ireland. Hamza (2 for 39) and Karim Janat (2 for 34) made the crucial strikes upfront, while Rashid (3 for 28) did a fine job containing and then cleaning up the tail after removing the dangerous Wilson. Earlier in the day, Nabi's pyrotechnics at No. 7 apart, there was no shortage of fours and sixes through the course of the innings. Shahzad, the explosive wicketkeeper-batsman, hit five sixes and six fours in his 43-ball 72, leading Afghanistan to a fine start even as the rest of the top-order failed to contribute in a big way. Kevin O'Brien (4 for 45) made inroads and received support from Jacob Mulder (2 for 32). Nabi walked out to bat at 121 for 5 in the 13th over. After six balls of getting his eye in, he launched his first six and was unstoppable thereafter. He put on a 74-run stand with Samiullah Shenwari for the sixth wicket, with the latter contributing just 13 runs. Nabi carried on till the last ball, off which he was run out. His knock of 89 is the highest from the No. 7 position. New Zealand's Jacob Oram held the record earlier with an unbeaten 66 against Australia in December 2007. This was Afghanistan's third total of over 200 in T20Is. Its previous highest score was 215 for 6 against Zimbabwe in Sharjah in January 2016. It had also scored 210 for 5 against Scotland in Edinburgh in 2015 during the ICC World T20 Qualifiers.